In this final chapter, Tyger Tiger and Wolverine are engaged in final battle with Roche. Wolverine takes a shotgun blast to the chest and in a vengeful rage, the Tyger beheads Roche. She leaves Logan – assuming he’s been killed – and takes over as Madripoor’s crimelord. Days later, Wolverine (all healed up now!) meets with the Tyger, at the Princess Bar, to let her know that if she crosses the line and becomes an “evil crimelord” that he’ll be there to take her down – just as Roche was. The freshly mutated Colonel Choate seems to have still retained his higher-brain functions even though his body has become grossly distorted. He intends to bring other Super Soldier mutates to Moscow, to destroy “the very heart of evil in the world”. A klunky looking robot wants Machine Man‘s advanced body for his own! But, you can bet our hero, aka Aaron Stack, isn’t going to let that happen without a fight. Colossus is torn between two worlds: the suppressive Russian culture that he was raised in and the exploitative American one he now lives in. And, while contemplating these differences in a local park, he stumbles upon an American family picnicking. And, while he observes them from a distance, the boy wanders off into the woods where he’s witness to a man being bound and beaten by several others. The Wolverine story asked an interesting question. Clearly Roche was an evil “crimelord” but, could his successor, Tyger Tiger, rule over Madripoor’s criminal underbelly but still keep her hands relatively clean? 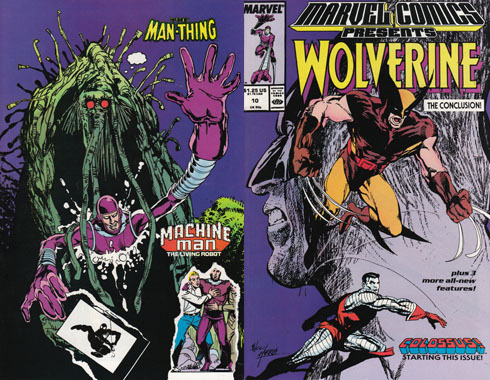 In addition, this tale debuted Wolverine’s Madripoor identity, Patch (characterized by the eyepatch he wears there). The Machine Man story was very bland (as was most of Ditko’s run on Machine Man , as I recall) but, the Colossus feature seems like it’ll focus on some great characterization.